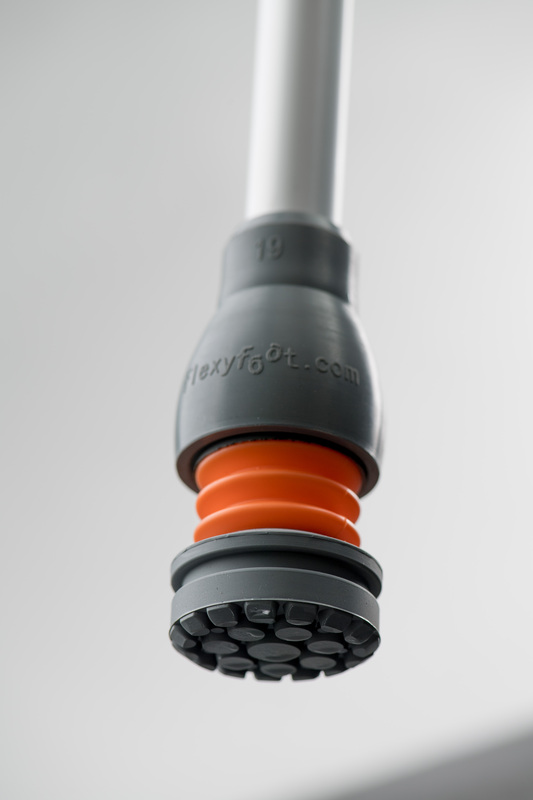 Flexyfoot Ferrule Provides Improved Grip And Stability. 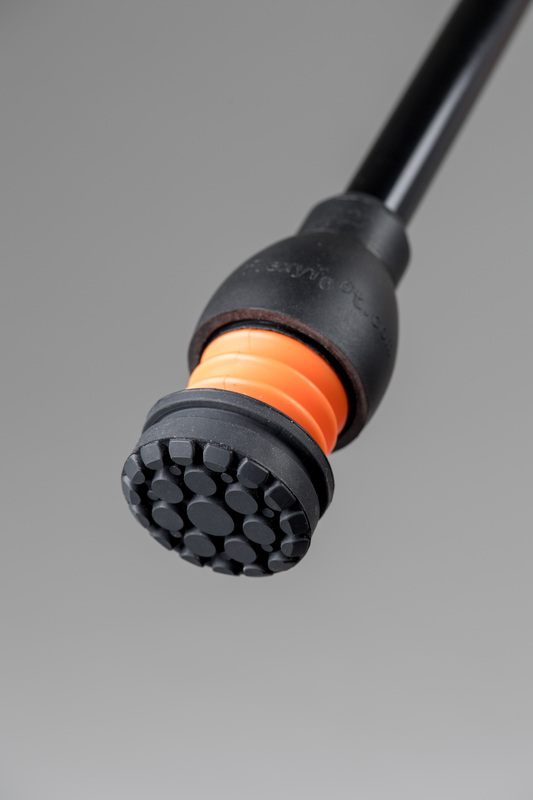 Flexyfoot is an award-winning new type of rubber ferrule that fits onto the tip of your walking stick or crutches.It is a British invention and is suitable for people of all age, shape, and size. 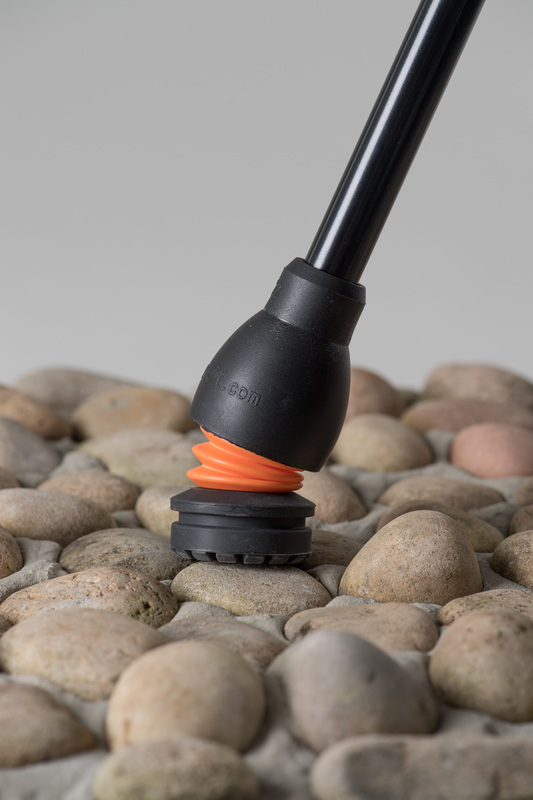 By replacing the brass or rubber tips on your sticks or crutches with our ergonomic and flexible Flexyfoot ferrule, you will not only extend the life of your walking aid but you’ll also benefit from less pain and discomfort and feel more safe and secure as you walk. An excellent product. It gives me much better mobility and more confidence. Well made, easy to fit. Well packed and prompt delivery. Have used them on double crutches for a few days on various surfaces. Enjoy the shock absorbancy, but would be happier if the foot itself was a little bigger to give me a better sense of security, not so happy about going up a loose surface slope. Excellent product. I use two crutches to walk and I lean heavily on them. I\'ve fallen before on tiles or wet floors but feel so much safer with the flexyfoot. Having used 2 crutches for a number of years I cannot get over the improvement with the Flexyfoot Ferrules. I\'ve already informed friends who, like me, are on permanent crutches how great they are. I really wish I\'d found out about these ferrules earlier. They have given me so much more confidence in walking because I am not worried that my sticks are going to slip and I have definitely noticed far less strain on my wrist and elbow from routine walking because of the shock-cushioning effect the ferules offer. The flexifoot ferrule gives better stability and does not feel different from a standard ferrule. Excellent product. Makes for more comfortable walking with my crutches and gives me more confidence. Very simple to fit. Received this today, so far looks like it will be much safer than the ferrule I am used to on my crutch. I uses crutch a lot of the time as I have had RA for many, many years. The problem with most walking aids is that when a surface is wet and slippery the aid slips and you go down with it, which has happened a few times to me, so am really hoping this will new ferrule will stop this happening and give me much more confidence when out walking. Ordered these ferrules as I noticed on many surfaces that plain rubber ones were prone to slipping when trying to walk with crutches. Fitted these Flexyfoot ferrules and after a bit of adjustment to the crutch length, I was very pleased with the results, Feels vary secure and comfortable. Impressed. I am currently road testing these Flexyfoot Ferrules. They may be the answer to my ferrules problem. I am a continuous user of my crutches all day. I support my full body weight on them and cover quite a distance at home and work. Basic ferrules wear rapidly and slip when you're not expecting it. The Flexyfoot may just perform better in every respect. As long as they are durable as well I will be very happy as they are a little expensive initially. I have been using them for a week so far and so far very good. Very pleased with their performance up to now. If they last two months before I need to replace the lower parts I will be very satisfied and will submit another review when I order new lower parts then with a 5 star rating. A fabulous product. It gives such feelings of security when out walking. Very pleased with the Flexyfoot Ferrule and I would recommend it. My only problem is, that because I walk with crutches (elbow) they make them higher than I normally have them and so it is taking a little time ajusting. Perfect ferrule, number of people have had the information and said they will be purchasing.